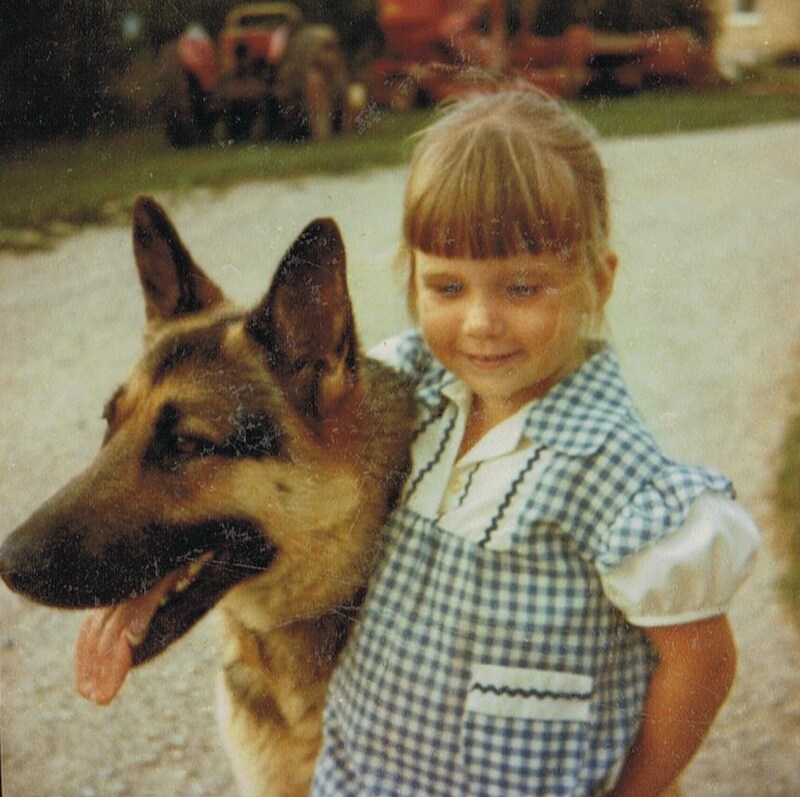 The first dog I ever had was a puppy named Heidi. I must admit, I was only a puppy myself at the time. She was a German Shepherd puppy and she was beautiful. Don't judge the bangs, or the turtleneck for that matter. At least I'm co-ordinated! 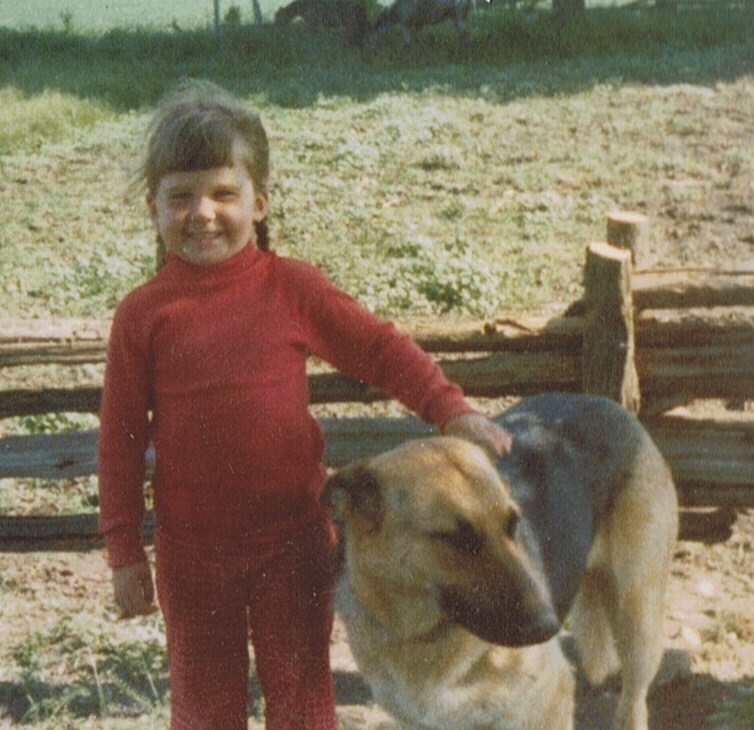 Because we lived on a farm, it seemed natural to have a second dog, since Heidi was starting to run with a neighbor’s dog and we worried about her getting too farm from home. So we got Rene. Rescued him, would be a better way of putting it. He was owned by a large German man who not only intimidated his wife and son, but the dog too. Rene finally had enough of being treated badly and dared to stand up for himself. This did not go over well with the owner. He wanted him gone. I am ever so glad, because Rene was lovely. Ironically, Rene was Little Sister’s dog. Not that he was given to “her”, since she was only an infant, but Rene, sensing that Heidi was responsible for me, took LS as his very own. This big “aggressive” male became bound to her in a way that could only be described as “darling”. When nap time came for my wee sister, Mom would put her on the front porch in her buggy. The breeze was cooling in the warm summer afternoons and it was out of the strong sun. Rene would watch my mother putter around with her regular tasks and park himself beside the buggy. When LS awoke and cried out, Rene would howl to let Mom know that the baby was up. Like the very first baby monitor. Rene would follow LS while Heidi followed me. We had our own personal body guards. The only time we ever had an issue was when Rene suffered from arthritis in his back hips. He slept fitfully one afternoon and I strolled past him with a bat resting over my shoulder. The bat was far bigger than the shoulder and within a second the bat fell on the dog’s back end, waking him suddenly and causing him intense pain. Remember, his history told him that when he was being hurt, he needed to defend himself, and he did. A small row of stitches were needed to heal the damage done, but I never blamed Rene for the bite. He blamed himself though. Upon my return from the hospital, Rene’s head hung as low as his tail. I was bathed in slobber as he licked me from ear to ear once I returned from the hospital. He felt bad for days after. Rene more than made up for it a couple of years later, when a boy older than me tried to push me around. He raised his voice and gave me a shove that sent me to the ground. Within seconds Rene had the boy pinned to the ground beside me. He never bit the older boy, but he scared him enough to leave me alone. By this time, my beautiful Heidi was gone. Rene pined for her as much as I did, so my parents found Britta. She was a female deemed unsuitable for breeding, as she had an overbite. While she wasn’t pretty like Heidi was, she was loyal and had a sweet personality. After these two dogs, our family had a string of others, usually adopted as full grown dogs and all loved for their own special traits. So when the time came to start a family of my own, I knew it had to include a dog. The Big Guy and I fell in love with a Dutch Chow pup and after we named him Cole, we started house training. Eleven years later he developed Cancer and we lost our first “Fur Baby”. That brought us to Samson. 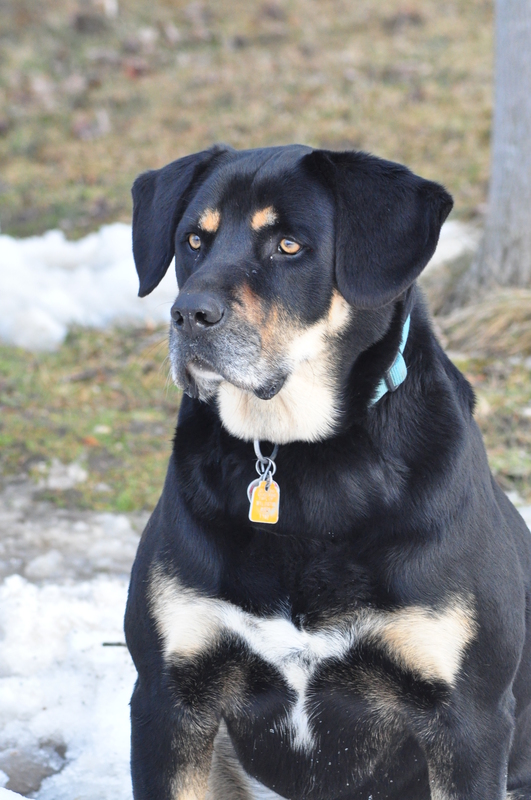 A purebred mutt, Sam was perfect for our young family. 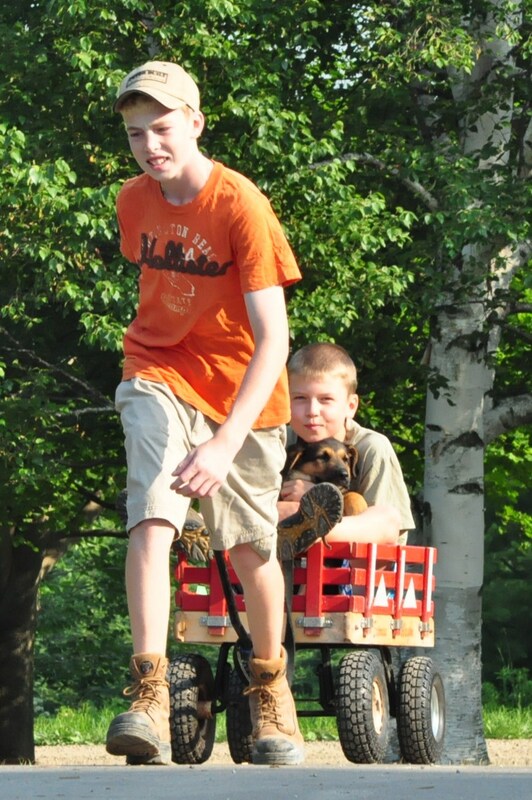 The boys loved him, and he was the best parts of Lab, Rottweiler and German Shepherd. The day we put him down was easily one of the worst in my life. We struggled with the decision to put him out of his pain, and in the end, I know it was the right thing to do. That didn’t make it any easier. Samson is the first dog we buried at our new home, and I look out on him every day. I could talk about how his bark could stop you cold, if you didn’t know him well enough. Or how grown men thought twice about just walking up to him. But then I’d have to talk about how he was actually as sweet as his caramel eyes, and how much he loved running at The Farm – which we also lost this year. And I can’t do any of this without choking up…so enough about that. The Big Guy got tired of my moping by the second day. He knows it’s not my way, but as I said, the last couple of days with Samson were really tough. “Why don’t you look at some puppies?” he asked. “I don’t think I’m ready for that yet,” I replied. He tried again the next day – pointing out I might feel better looking at puppies. A quick scan of kijiji found hundreds of puppies – all of which were cute. 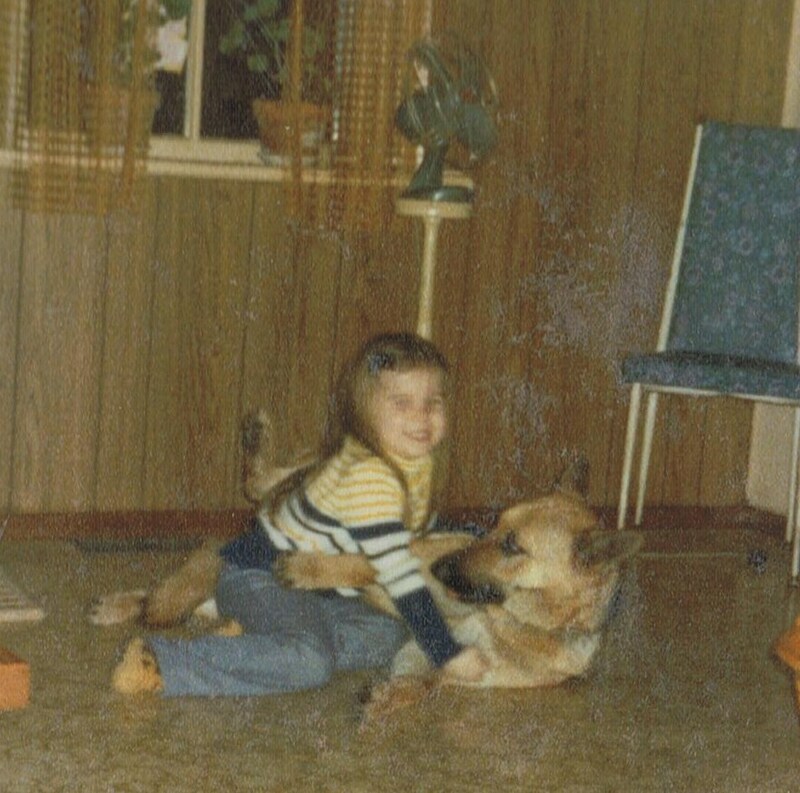 He was right – it was something “happy” but I still wasn’t sure that I could imagine our house with another dog. The Big Guy contact the people we got Samson from, and they wouldn’t have another litter until the new year. A quick consensus of the household determined we didn’t want one of Samson’s brothers – it would be too hard to look at him and not see Sam. Then it happened – a crazy combination of circumstances that gave me all the signs I needed. Before I knew it – there was laughter in the house – and smiles. And chew toys….for a new pup. 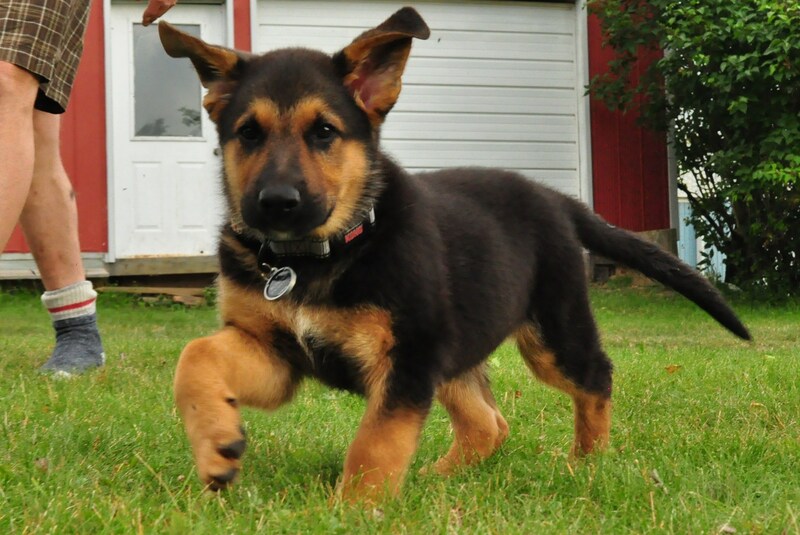 A German Shepherd named Roman. The ears almost give the ability to fly!